You think it’d be a simple process in choosing a bottle to simply carry your water in but there is a lot of choices out there with lids, materials, shape, size and filters. Due to this, choosing the best water bottle for you can actually be quite tricky. 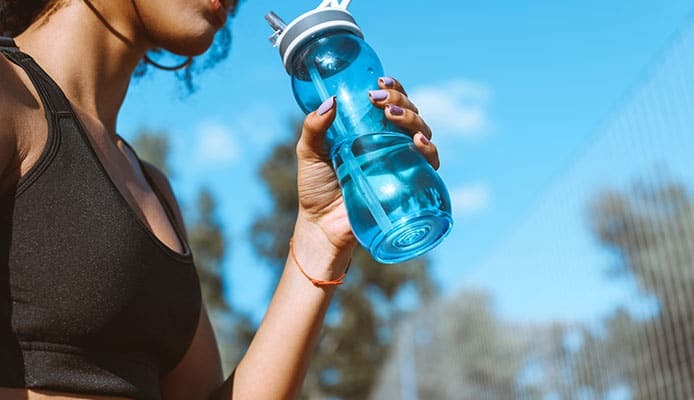 In order to help you find the best reusable bottle for you, we have looked into all these key features and looked at when and why they would be important to you. This will help to give you confidence that you are getting a great product. We have also completed water bottle reviews to show you the best products on the market and have looked at why they are so highly rated. Once you have read through this guide, you’ll know exactly what you need and where to get it. 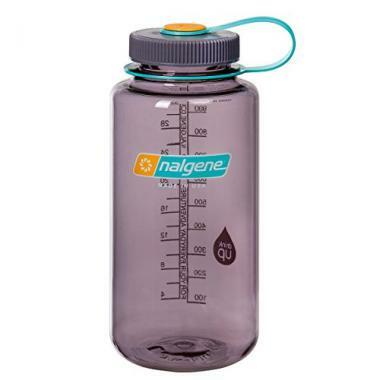 This is a top rated reusable water bottle from Nalgene and one that has received a huge amount of positive reviews from those who have used it time and again. That will give you confidence that you are buying a high-quality product that will last for a very long time. It is made from BPA-free plastic to ensure that you stay safe and that plastic is also impact resistant to make sure that the bottle doesn’t break and it can also be placed in the dishwasher too for easy cleaning, which further adds to its convenience. Another great aspect about this product is that it can be used for hot or cold drinks too. You should also be able to add a water filter if you wanted that options. Overall this is a brilliant water bottle and one that deserves the high rating that it has. If you’re looking for an insulated water bottle then this would be a great option. That insulation comes in the form of a vacuum and therefore it’s going to be able to keep the contents very hot or cold, depending on your preference. There are numerous size options available, slowing you to pick the ideal size for you. There is also a large range of color options and designs too and that will help to give the already stylish bottle more personality. Another great aspect about this product is that it comes with two different lids, a regular drinking one and also a splash proof lid for if you are carrying hot drinks. The copper coating adds even more insulation and ensures that your drink is always at the right temperature. 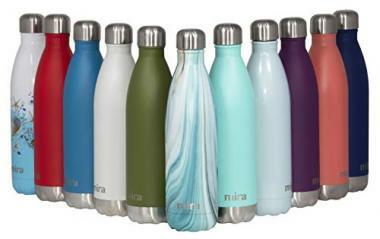 This insulated water bottle from MIRA has a stylish shape that looks great and it is also available in a wide range of different colors too. There are also three different size options and therefore you’re going to be able to get the perfect bottle for you. The bottle is heavily insulated and it is going to be able to keep hot drinks hot for up to 12 hours and also cold drinks cold for up to 24 hours. It has vacuum insulation and is made from stainless steel so you know it’s going to have a high level of durability. The mouth of the bottle has an easy flow which makes drinking out of it very easy and comfortable. The lid is leak-proof too and therefore you don’t have to worry about it when you place it in your bag or anywhere else. 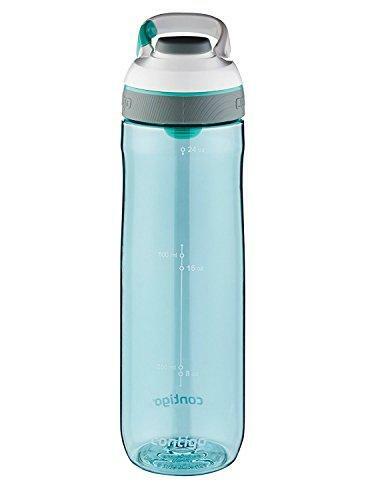 Contigo have made this stainless steel water bottle that is highly durable and should be able to last you for many years of use. 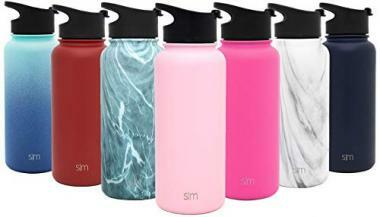 It’s available in eight different colors which all look great and it makes for a very stylish bottle. It has double-walled vacuum insulation that is going to help to keep your drinks at the temperature you want for a very long time. The bottle also has an integrated carrying handle to allow you to easily take it from one place to the next. One great feature of this product is that it has an auto-seal button that you are going to be able to operate with one hand. Once closed, the lid will ensure that no water is allowed to creep out of the bottle and leak out everywhere. When it comes to drinking cold liquids, most people prefer to drink them out of a glass container. This product from Chef’s Star gives you the ability to do that as it has a very strong glass bottle that is going to be perfect for a refreshing drink on the go. The glass bottle makes for a very stylish design which is added too by the sleek stainless steel cap that it has. Another advantage of having a glass bottle is that you don’t have to worry about any chemicals leeching into the material. It is able to hold 18 ounces of water and has a carrying loop on the top for added security. The bottles also come with a sleeve for added protection and if you’re looking for a high-quality glass bottle, then this could well be your answer. This plastic water bottle is another great product out there and a great option if you’re looking for a water bottle with straw, the spout and long straw that is on this bottle could be a great option for you. It has many great design features and is a stylish bottle. There is no lid that you would need to remove as it is all done via the spout system. The spout can be used with one hand and it is also covered when folded down to prevent any dirt getting in the bottle. In order to unveil the spout you simply have to press the button at the front of the bottle. The spout is leak proof but your further reassurance you can actually lock the button to make sure that it doesn’t come open without you knowing it. If you’re looking for a bottle that has numerous different designs and color available then you are in luck with this bottle as there are 44 different options available. Not only do they look great but you are sure to find something that matches your personality. To go with the many color options, there are also six different size options available. The bottle is vacuum insulated and made from stainless steel which has been given a powder coating. There is also a copper coating on the inside for added insulation. The lid of the bottle is leak proof and also insulated to help keep the heat or cold locked inside the bottle for as long as possible. This is also a very highly rated product and one that has been reviewed highly by those who have used it for a long time. 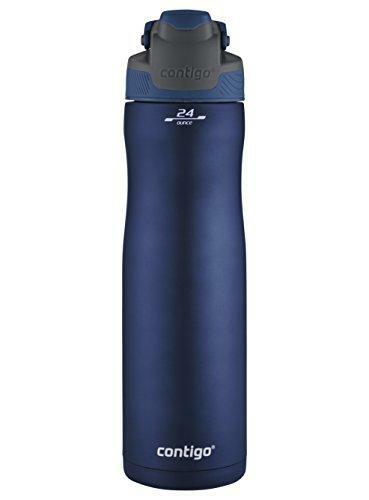 Contigo have made this lightweight water bottle which is another great product and one with an innovative spout. The auto-seal technology will be able to automatically seal itself between sips to give you peace of mind when you are using it. Another great feature of this product is that it has a carry clip that will make it very easy to attach to anything that you want. The spout on the bottle has a cover that clicks on and therefore it means that you can easily use the bottle with one hand. It is dishwasher safe and you are also not going to get any plastic odors or a funny taste with the bottle, which is FDA approved. There is a lifetime warranty offered on the bottle which should give you confidence that you are buying a quality product. 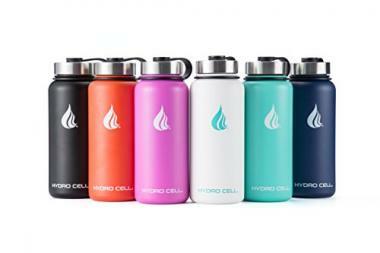 Hydro Cell have produced this great water bottle that is highly insulated to keep your drink either ice cool or lovely and warm. That is due to the fact that it was double-walled insulated that creates a vacuum to prevent any heat transfer. The grip on the bottle is slip resistant to ensure a tight grip which is helped by the fact that won’t create condensation on the outside of the bottle. Another great aspect out this bottle is that it comes with two different lid types of a flat steel screw cap or a sports top with a straw. This is another product that comes with many different design options and therefore it will be easy to find something that is perfect for you. This is a highly rated product and one that will surely make you happy if you’re looking for something insulated. It is going to be free from any odors and any chemicals to leave you with a perfect drink time and time again. One great aspect of this bottle is that it actually comes with its own cleaning brush if you are using any liquid that might stain them. The cap on these bottles is both leak-proof and airtight too. It’s suitable for both cold and hot drinks and has a slim design to make it easy to place on your fridge or a cup holder. This is a great product if you’re looking for something made from glass. The size that you need for your water bottle is going to depend on a few different things depending on your needs, how long you are going to be carrying it and what specific activity you are going to be doing. Once you have taken all that into account then you will be able to pick the perfect size for you. If you want to be running with it in your trail running shoes, for example, then you obviously wouldn’t want something that was going to be too big for your hands. In that respect you’d probably look for something like an 18 ounce or possible a 24-ounce bottle that is easy to hold. With the size of the bottle, there are also a few other factors that you need to take into account. You need to think about the overall weight of the product and you also need to think about the shape of it too. For example, if you were to get a stainless steel bottle that was about to hold 18 ounces then the weight of that bottle could be around nine ounces to add on top of it. That adds a significant amount of weight and affects the comfort levels of holding it. 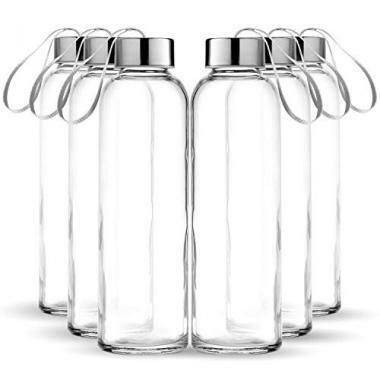 The shape is also going to be an important factor in your buying decision as a well-designed bottle might be able to give you a higher volume of water than another shape would and still be comfortable. Plastic bottles especially are generally more shapes in order to give you a more comfortable grip. If you were venturing out with your hiking backpack or your bikepacking bag, then you would want to make sure that the bottle is going to be able to fit in the pockets provided but another option would be to get a hydration bladder instead. The overall ounce capacity of the bottle is still going to be the biggest factor though in your buying decision when it comes to size. This will be a personal preference based on your own needs and what type of activity you are doing. If you’re going to the gym or anywhere you can place your bottle down, then you can simply get the biggest one you want. There are other considerations too when it comes to the size of the bottle and that is how it is going to travel. If you want to be able to place it in a cup holder then you are going to be limited by the size and shape of the bottle, this is one piece that most companies are happy to display. These water bottles come in a very wide range of different materials. The best one for you will depend on your own personal preference, as well as where you are going to be taking the water bottle and what you will be using it for. It’s always interesting how people think that drinks can taste differently depending on the container that they are in. A great example of this is with coke as many say it tastes different in a metal can, a plastic bottle or a glass bottle and this is a matter of preference. The majority of people won’t choose plastic as their first choice and that makes you wonder why it is still the overwhelmingly used material in the making of soft drinks, especially those over a certain size. This is clearly because plastic is cheap, easily managed and highly durable. These are reasons that many people buy plastic bottles in order to hold their water. You know that if you drop it that it won’t break and you know that it’s going to last for a very long time without getting damaged. This makes water bottles a good idea for those wanting to do any physical activity. With plastic bottles though, you need to be careful as chemicals from the plastic can seep into water unless it is of the highest quality. Soft drinks bottles shouldn’t be used for an extended period of time for this reason. You want to make sure that the bottle you are getting is BPA-free. There is a reason that in your cupboards at home that you won’t see a lot of plastic cups and there is also a reason why you won’t see metal ones either. The same could be said for a bar or anywhere that you drink. That’s because, for whatever reason, people love drinking out of glass. Everyone knows what the biggest downside is to glass though and that is the fact that it smashes. This doesn’t make it ideal for the mass production of soft drinks and best beer bottle cooler are only made that way due to public demand. The glass that is made for bottles of spirits is very thick to protect against this. As everyone knows though, not all glass is the same. The glass in your windshield isn’t like the glass in your favorite drink holder just as it isn’t the same for the glass that lines all the biggest skyscrapers in the world, regardless of what the movies would have you believe. Glass water bottles are popular due to the fact that people love drinking out of a glass. They are also made to be highly resistant to breaking and are made out of highly durable glass, allowing you to drink the water with confidence. Some will prefer not to take the risk and opt of something that they feel is going to be safer. There is a good middle ground between plastic and glass though and that is metal, with that metal usually being stainless steel or aluminum which are both durable metals but also light and fairly cheap too. For many this would be nice than drinking out of a plastic bottle but without the risks associated with drinking out of a glass bottle. These products are going to be very strong and durable but they are also ideal for one of the most important features too, and that is insulation. Everyone knows what would happen if you put a pin in a balloon as that’s due to the fact that the air pressure inside the balloon is much higher and desperately wants to escape, if you put too much pressure in the balloon or puncture it, it will pop. The opposite effect happens with a vacuum as the air outside of it is at a much higher pressure and therefore wants to get into the airless space. This creates a large amount of tension on the outside of the vacuum and it’s not something that’s feasible to cope with if you are trying to make a bottle out of plastic or glass. 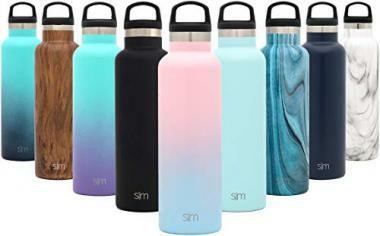 If you want an insulated bottle then this is going to have to be made out of metal and what makes these products hugely tempting when it comes to storing your water, or any other type of liquid. The best bottles here would be able to keep in warmth for 12 hours and keep in cold for 24 hours. There is also the advantage of the fact that metal is highly durable and therefore it is a product that is going to be able to last for a very long time. A lot of the metal bottles can also look very stylish too and have numerous designs. Clearly then there are large advantages and disadvantages for all three of the main options. The best one for you is going to comes down to your own personal preference and which of the advantages you hold most highly. If you want the best taste, go for glass. If you want the best all-around usability, go for plastic. If you want insulation, opt for metal. Getting a filtered water bottle is a great idea in certain circumstances but in others it would just be a needless accessory. You always want to have clean water but you don’t want to be spending money that you don’t have to and you don’t want to be needlessly changing filters either. If you are just looking for a water bottle to go to the gym, for example, then it would probably be a better idea to get a home water filter pitcher that you will be able to enjoy at all times and pour into your water bottle when it is required. It could also simply be the case that the water that you get out of your faucet is of sufficient quality and you don’t have to worry about the water being filtered. This would be your own personal preference and how you would prefer to have your water. For most situations, you wouldn’t need to have a filter in your bottle as your water would be more than fine. One good option to have though is the ability to buy a filter that you would be able to put into your bottle as and when you need it. If you were planning to have a backpacking trip, then that would be a good example of a time when having a filtered water bottle would be a good idea as it would give you the option to having water from a fresh source which would be too dangerous without a filter involved. There are backpacking water filters you can get to ensure that the water is clean. This, ultimately, is a decision for you to take based on your own individual circumstances and if you are going anywhere that you feel would require one. If you do, then there are plenty of options for you out there to get the freshest water that you possibly can. All of the products that we have listed here are of the highest level of quality. That’s not the case with all water bottles though and some leave a lot to be desired when it comes to the construction of the bottle and the taste that you’re going to be able to get. Cheap plastic bottles often won’t have the highest safety rating and also not only can you smell the plastic when you go to take a drink but with some you would actually be able to taste it. That’s why if you want a plastic bottle, it’s important to get one with a high level of quality. Glass bottles simply have to be of a high enough quality in order to ensure that they don’t smash easily. The glass bottles that we have looked at here are highly durable and are going to be able to last you for a very long time. Metal bottles also have to be made with a decent level of quality, as they are very often vacuum insulated which requires a good level of construction. There are differences between one and another though and it’s important to look at its lid and the other features that it has. It’s hard to judge the quality of an item sometimes and there are a few key markers that you will be able to look at. One of those markets is the user reviews that it has. Looking at a product and using it for a week can give you a good idea of the quality, but seeing the opinion of someone who has used it for much longer is always a great idea. The lid usually gives you a lot of information about a water bottle too. Many of the low-quality products will have what very much looks like a low-quality plastic lid. The more highly rated bottles with be made with a lot more features, or higher quality material. It seems as though ease of use shouldn’t really be a concern with water bottles but there is a surprising difference between one bottle and the next. Here we look at some of the key aspects that separate the good bottles from the great ones. One of the aspects that can help with the ease of use is having a straw. This would obviously mean that you didn’t need to tip up the bottle in order to get a drink which allows you to take a nice drink of water without looking at what you are doing. Straws can sometimes, but not always, but a feature of a bottle that is able to be used one-handed. A regular soft drink bottle it a good example of a bottle that can’t be opened with one hand and if you need to unscrew the lid then you won’t be able to use it while you’re on the go. A one-handed operation is available on many bottles but it can vary quite a lot in quality. You would want to make sure that the lid is leak-proof when you are not using it to prevent any accidents from happening. Another important aspect to check that might often be an issue is how the bottle is going to open. If you’re the type of person who likes ice cubes in their drink, for example, then you want to make sure that you are getting a bottle that is able to do this. This is a decision that will in large part come down to personal preference but it can also come down to ease of use too. Bottles with straws are particularly easy to use for a couple of important reasons with one of them being the ability to drink the bottle in an upright position. For some, this would make the drinking process easier as you are able to take in your water without the need to tip it into your mouth and not have the rely on the force of gravity in order to be able to take a drink of water. 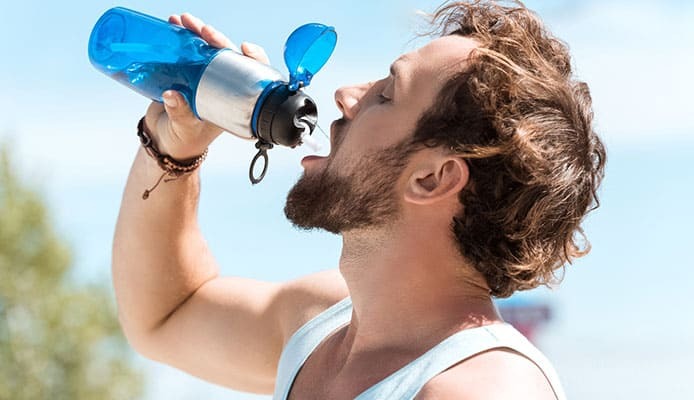 Other prefer that though, and not having a straw allows you to have a great volume of water more quickly which some people might need after they have been doing an intense activity. With a straw you are limited by how much can pass through in a single breath. There is also the aspect of hygiene too. 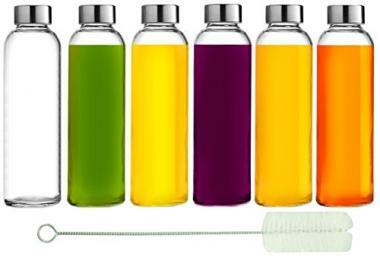 Bottles with a straw will require a more thorough clean and also will need to be cleaned more often. This adds to the maintenance of the bottle which some people may prefer to live without. This mostly comes down to a personal preference though and you will know whether or not you want to have a water bottle with a straw or not. If you do, you will also be tied to one material as straws are only going to be available on plastic bottles. Just like straws are almost always going to be found on plastic bottles, vacuum insulation is going to be found on metal bottles. That’s because the material has to be strong enough to be able to deal with pressures involved in making a vacuum. Vacuum insulation is often associated with hot drinks where people will place their coffee inside and will be able to enjoy that just-made warmth for the whole day. They can also be perfect for cold drinks too and work brilliantly as a water bottle. Bottles with vacuum insulation are actually able to keep drinks colder for a longer time than they are able to keep them warm, which means that they are actually better for colder drinks and will be able to ice you cold refreshing water for a whole day. The need for this will depend on the activity that you are doing. If you are only going to be out for a short period then there probably isn’t going to be much need for insulation but if you are doing an endurance activity, it’s much more likely to be of interest to you. Having insulation also allows you to have more versatility with your bottle too. You would be able to use it for both hot and cold drinks whenever required, as long as you cleaning it properly between uses of course. You often see the term BPA when it comes for plastics, and it is a contraction of bisphenol A, which is a chemical that has been widely used in the production of plastics and is the main component in the manufacture of polycarbonate. Polycarbonate is a clear and strong plastic which has often been used in water bottles, baby bottles and food containers among other uses. It’d be a fair point at this point to wonder what the fuss is about as chemicals are used in the production of all plastics. The problem is that over time chemicals can leach into the water as is slow starts to degrade and also small scratches can form. Due to the fact that this happens, it means that you need to ensure that the small amount of chemical that can come out won’t have a detrimental effect on the body. Unfortunately with BPA, it is widely accepted that those trace amounts can cause you harm and therefore you should never use a product with BPA for too long and that obviously includes a water bottle that you are going to use time and time again. Thankfully when it comes to the more reputable brands, and the ones that we have looked at here, they know that in order to be a quality product that they have to be BPA-free. While all the plastic products we’ve looked at here are BPA-free, this is something that you should always look out for. This is also where there is an advantage for glass and metal product as these are things that you are not going to have to worry about and you can have peace of mind that you can use the product multiple times without worrying about chemicals leaching in. Q: Why Choose A Reusable Water Bottle? A: If you want to have water then there are a few options that are open to you, as you can either get a reusable water bottle, a bottle of water from a store or you also might have other options such as having your water from a drinking fountain. Single-use water bottles can be convenient, especially to get filtered water but there are a few drawbacks to that. One of those is that the bottle won’t be the easiest to drink from, especially compared to the products we have looked at here. You also have to consider the cost too. Over time, all those individual sales of water will add up into something quite significant. If you bout a $1.50 bottle of water for 5 days in the week, every week, then over the course of a year that would cost you nearly $400. There are also other factors such as hygiene, being environmentally friendly and having something that is the perfect size, weight and color for you. It can also be a great idea to get your own water filter at home to be able to get fresh and clean water. Q: Can I Wash My Water Bottle In The Dishwasher? A: This depends on the individual bottle and also what it is made out of. Aluminum and glass bottles are going to be much more resilient to the heat that can come from dishwater than a plastic bottle, but there are still plastic water bottles that can be washed in a dishwasher though. If a plastic bottle can be washed in a dishwasher then it will often state that it should only be placed in the top rack of it. The reason for that is because the heating element will be on the bottom and therefore the temperature in the bottom will be a lot higher. It’s probably best to avoid the dishwasher though if you can though as residue from the cleaning can be left behind which can affect the taste and most water bottles will only need a light clean. If a deeper clean is needed though, a water bottle can be a great idea. Q: What Is The Best Material For Reusable Water Bottle? A: As mentioned in the materials section, each material is going to have its upsides and downsides and there isn’t one that you could definitely say is better than another. They all specialize in one area or another and therefore you need to weigh up what is the most important to you. Plastic is a material that is commonly associated with water bottles and can be great in its own right but many would prefer to have the great taste of a glass bottle or the insulation that a metal bottle is going to be able to provide. Water bottles are a very common feature of everyday life and you will see plenty of them in any gym or office that you go too as well as being everywhere else too. It only makes sense that you should get the best bottle that you can. As we have seen here, there are many different aspects that you need to take into account before you can choose the best bottle for you including size, material, quality and ease of use, among all of the other factors that we have looked at. Hopefully all the information here has been able to give you a clear idea of exactly what water bottle you need. Once you’ve made your perfect choice then you are going to be able to have easy access to your water wherever you might need it.